Longhorn cattle graze in the trees and brush along the Little Missouri River at the North Unit of the Theodore Roosevelt National Park near Watford City. Longhorns on the Long X trail to North Dakota. It started hundreds of years earlier. They originated in central Asia and were brought to Latin America, especially Mexico by Spaniards in the 1600’s Now fast forward to 1845 to know why Longhorn cattle are preserved at the North Unit of the Theodore Roosevelt National Park. The breed is very important to the development of North Dakota. The Long X Cattle Company, west of Dallas was a brilliant economic venture by the Reynolds Brothers. They established Long X ranches in New Mexico, Arizona, Montana and North Dakota – the destination points for the longhorn cattle drives. At one time, their Texas ranch as 250,000 acres! Good timing and bad men made it possible for the Reynolds to buy a ranch south of Watford City, north of Grassy Butte along the Little Missouri River. The Long X ranch was in this valley that is now the North Unit of the Theodore Roosevelt National Park. When the Reynolds brothers learned the sheep ranch was for sale, they bought it and the homestead, complete with buildings in 1885. They moved in their longhorn cattle and established their Long X ranch where the North Unit if the Theodore Roosevelt National Park is now. Right at home where thousands of Longhorn cattle grazed along the Little Missouri River. The Reynolds started in North Dakota with 4,000 head of longhorns. They successfully moved more than 11,000 head to the Badlands by following cattle trails and making their own routes. Their cow boss, A.N. Jefferies of Dickinson was so keen on raising cattle economically, he became a legend to all North Dakota ranches and helped found the North Dakota Stockmen’s Association. Cowboys had to be alert moving longhorns, and keep them in the herd. Libby writes that the Longhorn cattle had a roaming instinct. So, when they crossed a buffalo trail, they’d head off on the buffalo trail instead of where the cowboys were herding them. It was said they had an “obnoxious” characteristic about them. Every morning, the cowboys divided up a 20-mile radius and rode out to round-up the wandering longhorns. Longhorns were scrawny and underweight after months on the move up from Texas. They grazed on North Dakota Badlands grasses for two years. Once they were fattened, cowboys herded them to Belfield, North Dakota, loaded them on a train and shipped them to Chicago packing plants where they got top dollar. The Long X trail picked up the Little Missouri River near Devils Tower and following a compass direction, headed toward the bustling cow town of Marmarth, Amidon and through Belfield to the ranch. The National Park Service and the Interior Department published this map in 1958 in the book Theodore Roosevelt and the Badlands. The start of the Little Missouri River in Wyoming near Devils Tower is little more than a creek, but it’s where the Long X trail started following the river to the Badlands of North Dakota. The trail continued past Marmarth, North Dakota, Amidon and north through the Badlands along the Little Missouri River to North Dakota’s Long X ranch. Each cattle drive brought thousands to North Dakota. Longhorn herds of 4,000 and more up to 12,000 moved up the trail. Then came the slow closing of the romanticized stories of Badlands ranching. A one-two punch came in the summer of 1886 and winter of 1886-87. First was the devastating drought of 1887. Next came a deadly blizzard that killed the cattle who had no feed from the summer drought. It ended many cattle operations in the Badlands including that of Theodore Roosevelt who ranched a few miles south of the Long X Ranch along the Little Missouri River. Literally, thousands of cattle were killed in the blizzard, their bodies rotting on the prairie in the spring. The Long X ranch lost 4,000 cattle that winter. That ended the North Dakota Long X operation for the Texas owners. They sold the Ranch to a Boston company that didn’t know what it was doing, and in the end, the ranch went broke. The Long X name lives in Western North Dakota. On the same land as the Long X ranch once stood, a tourist attraction boasted of outfitting travelers who wanted to kayak or canoe the Little Missouri River. Today, it’s abandoned. The Little Knife recreation area sits between Highway 83 and the Theodore Roosevelt National Park. You can explore a bit of the Long X trail. It ties into the Maah Daah Hey trail along the Little Missouri River across from the North Unit of the Theodore Roosevelt National Park. The end of the Maah Daah Hey trail is the start of the Long X recreation trail. It’s south across the river from the North Unit of the Theodore Roosevelt National Park. Another marker is in the Park, a sign marks a point along the Long X trail. The sign at the North Unit of the Theodore Roosevelt National Park helps give the precise location to the trail and the ranch headquarters in ND. Outside the Park is the through-truss bridge called the Long X Bridge. The Long X bridge, a through truss bridge has been identified for replacement with a flat typical bridge that can handle modern traffic. To the east is the Long X road that follows the Little Missouri River, halfway to Killdeer, ND. East of Highway 83, the Long X road follows the Little Missouri River to the north of Killdeer — though a good section of the road is on private property and is fenced off. In Watford City is the Long X Visitor Center and museum. Long X Visitor Center in Watford City. The National Park Service sees longhorn cattle as being an integral part of the Badlands and ranching in this part of the U.S. The small herd at the North Unit of the Theodore Roosevelt National Park is living breathing history. The amazing critters whose ancestors come from India and China are at home in the park. So, when you spot the longhorn cattle in the Park, you are looking at a long history of 500 years. Think Spanish Conquistadors, Mexican ranchers, Civil War survivors, economic entrepreneurs, tough and determined men living on horseback, working 7-days a week, in all kinds of weather, night and day eating beans and fry bread, sleeping on the ground every night for months. They are wary critters, but early in the morning, you can see them as they mooo-ve round by the Juniper Campground. What happens when the National Park’s herd of longhorns wake up early in the morning and mingle with their park mates, the bison? They go for an early morning dip. You can see it here in this video we shot this summer. A history of the longhorn cattle in the Badlands is here from the National Park Service. Part one of this short history is here. Part two of this short history is here. And on our bucket list, someday, somehow, some time is to ride motorcycles as close to the Long X trail all the way to the Tex/Mex border. Love to do it! If you’re acquainted with all or parts of the Long X trail, we’d love to know what you know. Gives us a shout! 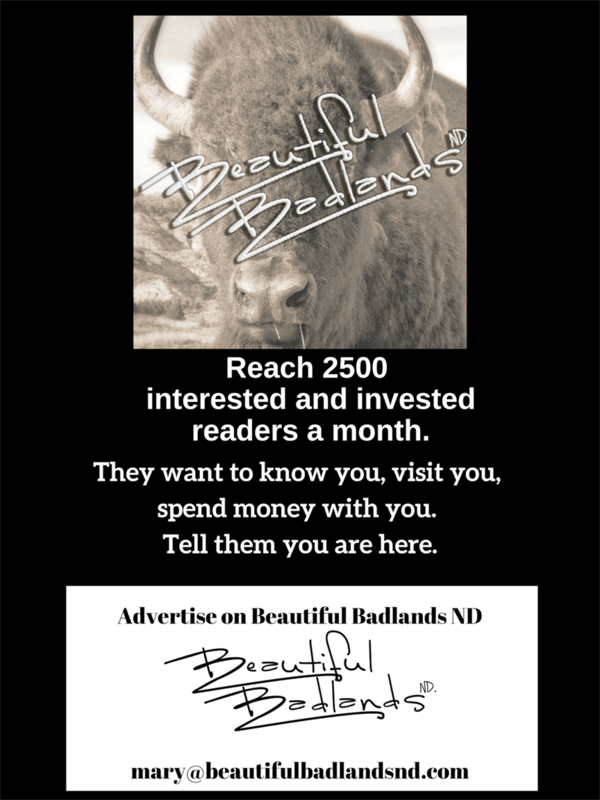 Want to get an alert when a new Beautiful Badlands story is posted? Just enter your email above on the right. No spam, just a notice a new story is ready. Who do you know who would be interested in learning more about the longhorns? Just click one of the share buttons. They’ll love you for it — almost as much as we love you! This is a great piece on the Long X Trail.! Do you know of any resources where I could find a print map of the Long X Trail? A lot of cattle trails are romanticized like the Chisholm trail and the Great Western, but I can hardly find any information on the Long X. Great story and website. As a son of western North Dakota (Mandan and Dickinson), and now a retired journalist, I love the history. And the photographs are breathtaking. I would like to recommend, however, that you double-check the Long X Trail route. I’m quite sure it follows what now is U.S. Highway 85 through North Dakota, not U.S. Highway 83. Oops. you’re right. I’ve made that mistake many times. Good Catch. Thanks.